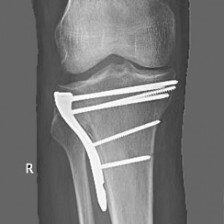 An example: Before I was operated on I was told I would be having, “an open reduction of the tibial plateau, arthroscopically assisted, with internal fixation by plate and screws.” I only had a vague idea what this meant and no clue whatsoever what a reduction is. Reduction: A surgical procedure to restore a fracture or dislocation to the correct alignment. This use of the word “reduction” does not imply any sort of removal or decrease but indicates a restoration. It’s those old Latin roots: re (“back [to normal]”) + ducere (“lead”/”bring”), i.e., “bringing back to normal.” When the tibial plateau fractures, the fragments are displaced or depressed and lose their alignment. For the fractured bone to heal without any deformity, the bony fragments must be re-aligned to their previous position. Orthopedic surgery attempts to recreate the normal anatomy of the fractured bone by reduction of the displacement. Reduction can be by “closed” or “open” methods. Open reduction the surgical technique where the fracture fragments are exposed by dissecting the tissues with a scalpel. Fixation: Once the fragments are reduced, ie put back together they will not stay there without some help. The reduction can be maintained by the application of casts or traction. In many cases, including mine, the fixation is held together or maintained by a metal plate fixed to the top of the tibia, by self-tapping screws. Fixation may be internal or external. 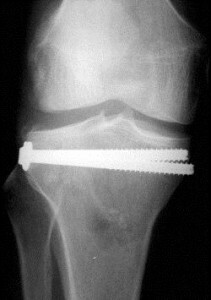 Internal fixation the maintenance of reduction by use of implants such as a plate and screws or rods inside the leg. External fixation the maintenance of reduction by the use of external pins and rods inserted through the skin, fascia and muscle. This usually only occurs in very severe fractures. Deep vein thrombosis (DVT)Deep vein thrombosis, is the formation of a blood clot (thrombus) within a deep vein, usually in the legs. Symptoms include pain, swelling, redness, warmness, and engorged superficial veins. It can be a fatal complication if it leads to the formation of a Pulmonary embolism. This potentially life-threatening complication, is caused by the detachment of a clot, that travels though the deep veins in the leg, such as the Popliteal Vein, and lodges in the lungs. Along with Compartment Syndrome, DVT is the most serious complication arising from Tibial Plateau Surgery. Compartment Syndrome wont kill you, but a DVT might. Prevention options include walking as soon as possible after surgery, calf exercises, anticoagulants such as Warfarin, Clexane, Xarelto and aspirin, and the wearing of graduated compression stockings. Compartment syndrome You are unlikely to suffer Compartment Syndrome from a type I or type II tibial plateau fracture of the sort usually associated with snow skiing. Compartment syndrome usually presents in patients suffering really severe types of plateau fractures where the centre of the calf sustains significant injury. This is known in medical lingo as the proximal, posterior, calf muscle (Proximal=central. Posterior= in the rear). In simple terms the injury you suffered which broke your leg has also damaged the blood vessels. These blood vessels swell and leak, causing inflammation. Fluid builds up in the area contained by the fascia. You are bleeding internally in your leg and the fluid has no place to go. It gets so tight in there that the normal arterial and venous flows in your leg are obstructed and the muscle structure grinds to a halt. If left untreated the tissue in your leg will start to die. Luckily if you are going to suffer compartment syndrome you will know about it within several hours of incurring the injury. You will notice severe, unremitting pain out of all proportion to the bone injury. Your calf will swell and become firm, and passive movement of your calf muscles will result in further pain. Some of the symptoms of compartment syndrome e.g. a swollen calf are similar to a DVT. Like a DVT it can go undetected if the surgeon is not focused on complications from tibial plateau injury/surgery. If you are in the slightest doubt you should insist that your orthopedic surgeon refers you to a vascular surgeon for a clinical diagnosis which may require a CAT scan of your leg. If you are diagnosed with compartment syndrome you will be treated via a surgical procedure known as a fasciotomy of the affected calf. This involves cutting away the fascia to relieve the pressure in your leg. The fascia is thin connective tissue covering, and separating, the muscles and internal organs of your calf. It varies in thickness, density, elasticity, and composition, and is different from ligaments and tendons. Be aware that compartment syndrome may appear after you injure yourself but before surgery. It may require treatment before the operation to stabilise your fractured leg. A further complication is that the pain from compartment syndrome may be masked by the heavy painkilling drugs taken to alleviate the pain of the fracture. Postoperative nerve blocks may also mask a compartment syndrome. OdemaA condition where fluid is trapped within a body cavity such as the lower leg. Unlike the blood vessels, which have the heart to act as a pump, the lymph glands, which act as the body’s drainage system have no pump. Since the system has no pump it relies on muscle movement to push fluid away from the feet and calf muscle and back up into the torso. Meanwhile, gravity is doing the opposite – drawing the fluid down to the peripherals (parts furthest away from the heart). The main areas that will become affected are the peripheral ends of limbs, particularly the lower legs. Treatments include gentle rhythmical massage or compression bandaging. Both methods try to push the lymph through the blocked enlarged glands (nodes). This can be both painful and slow and as lymph is constantly being made by the body it soon builds up again. Arthroscopy assisted surgery Is surgery achieved by using minimal incisions around the fracture and the use of a video probe known as an arthroscope to reduce the joint surfaces and fractured bone. This technique is more fiddly and time-consuming than other techniques, but leads to a much smaller incision and soft tissue trauma. Arthrotomy. A surgical operation that involves cutting into a joint of the body an example would be an operation that involves cutting into the knee joint in tibial plateau surgery. Percutaneous screw fixation: A surgical technique where cannulated screws are used to fix the reduction but no plate is used. In surgery, percutaneous means any surgical procedure where access to inner organs or bones is achieved by puncture of the skin, rather than by using an “open” approach where bones or tissue are exposed by the use of a scalpel. 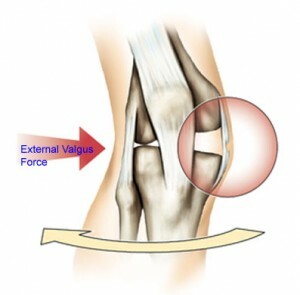 Valgus refers to a force from the outside of the knee which pushes the knee inwards and out of its normal alignment. A Valgus injury can occur when a footballer is in the knee hit from the side or when a skiier, in an already bent posture, is forced into an even more bent shape with additional loading on the knee eg in landing incorrectly from a jump. Think of a knock knee. A knee which is valgus is knock-kneed. A Valgus force will tend to push one knee towards the opposite knee loading up the outside edge of the tibia and sometimes fracturing it. This is the most common form of tibial plateau injury among skiers. Varus refers to a force from the inside of the knee which pushes the knee outwards from its normal alignment. A Varus injury is very rare in skiing. Think of a person skiing bow-legged. This will present as varus. A Varus force will tend to push one knee away from the opposite knee loading up the inside edge of the tibia, sometimes fracturing it. If you are reading this and you suffered a tib plateau fracture while skiing, its unlikely that you got it this way. An example of jargon: Tibial plateau fractures are serious articular fractures that are challenging to treat. Arthroscopy-assisted percutaneous fixation is the treatment of choice in Schatzker types 1, 2, 3, and 4 fractures, as it ensures optimal reduction and stable fixation consistent with early mobilisation. The most reliable fixation method seems to be percutaneous cannulated screw fixation, which is less invasive than open plate fixation. In complex proximal tibial fractures, arthroscopy may allow an evaluation of articular fracture reduction, thereby obviating the need for extensive arthrotomy. Complementary stable fixation is crucial and should allow early mobilisation to reap the benefits of the arthroscopic assistance.